Surprisingly for someone who reads a reasonable amount (ahem!) of Russian literature, it’s only struck me relatively recently that much of what I read has been written by men. Particularly in the era before the revolution, the big names are male – Gogol, Dostoevsky, Tolstoy, Chekhov et al – and the women’s voices seem to be either non-existent, or possibly just not translated. I think the tide is starting to turn a little nowadays; the translations of the Columbia University Press’s Russian Library (Sofia Khvoshchinskaya already issued, and Karolina Pavlova forthcoming) are doing much to redress the balance when it comes to authors from the 19th century. The 20th is perhaps a little better represented, though mainly with poets; so I was pleased to be alerted by a post on translator Boris Dralyuk’s excellent blog to the existence of “Slav Sisters”, which had somehow slipped underneath my radar. Dedalus Books are a publisher of literary fiction with an impressive backlist, which includes much translated literature. Laudably, Dedalus has declared it will celebrate women’s literature from 2018-2028 by publishing six titles a year for the decade to celebrate the anniversary of women getting the vote in the UK in 1918. Apparently most of these will be translated from other European languages, and “Slav Sisters” is a fine entry into that list of books. 1. Kishmish and Solovki by Nadezhda Teffi, translated by Robert & Elizabeth Chandler. 2. My Jobs by Marina Tsvetaeva, translated by Jamey Gambrell. 3. 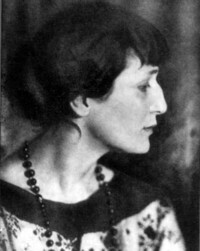 Autobiographical Sketches by Anna Akhmatova,translated by Andrew Bromfield. 4. Delusion of the Will by Lydia Ginzburg, translated by Boris Dralyuk. 5. The Lady with the Dog and The Death of an Official by Galina Scherbakova, translated by Ilona Chavasse. 7. The Stone Guest by Olga Slavnikova, translated by Marian Schwartz. 8. The Gift Not Made by Human Hand by Ludmila Ulitskaya, translated by Arch Tait. 9. Philemon and Baucis by Irina Muravyova, translated by John Dewey. 10. Landscape of Loneliness : Three Voices by Svetlana Alexievich, translated by, Joanne Turnbull. 11. The Jewess’s Farewell by Margarita Khemlin, translated by Arch Tait. That’s a staggering amount of talent, both in terms of the authors *and* the translators, to have featured in one volume! And indeed the contents make gripping, absorbing, moving and memorable reading. Well, I could go on and on about the jewels in this collection, but in fact each story is a gem. Editor Natasha Perova (who has an impressive pedigree, including starting the small press Glas) has chosen what I think is a perfect selection of works to not only show the variety of women’s writing from the last century, but also to tell women’s stories. That latter element was what stood out for me most strongly after reading “Slav Sisters”.These are voices that would have been silenced under Soviet rule, and it’s only with the collapse of the Communist regime that they’ve been able to find an outlet. Interestingly, I was reminded when I set out to write this post about the women authors who *were* published during the 20th century; I refer of course to those writing in the science fiction field. I’ve read a number of these authors in recent years and maybe that was one genre women could tell a story in, although many of these works were in coded form, with the actual meaning hidden under the narrative to avoid the censor’s eye. I could go on and on about how good these pieces are; how heartbreaking in many places; and how it’s a crime that all of these women have not been better known before. I was aware of many of the names already, of course – Teffi, Tsvetaeva, Akhmatova from the early years, plus Ulitskaya and Petrushevskaya from more recent times. However, several were new to me which makes the anthology especially valuable; I was particularly taken with Galina Scherbakova and Olga Slavnikova. The works are presented in what I assume is roughly chronological order; I *would* have liked to see a little more information included about original publication date and location for the pieces just to provide context. However, if nothing else the anthology proves that women all over the world have the same needs, desires, problems and everyday issues to deal with. We certainly are all sisters under the skin and this exceptional collection really is essential reading. Review copy kindly provided by Dedalus Books, for which many thanks! At the risk of becoming a bore, I have been ruminating a lot on translated literature again. As I hinted in an earlier post, I’ve been reading a lot of Russians recently (no surprise there…) and in particular poetry. Now poetry must be the hardest thing in the world to translate, particularly from a language as far removed from English as Russian, with its completely different alphabet. I’ve read Russian poetry for decades, and never really queried too deeply who was rendering it and how until recent years. A good case in point is the work of Mayakovsky; I first discovered him in my early 20s and the versions I had were translated by Herbert Marshall (I’ve written about them before on the Ramblings). However, I’ve no way of knowing how good they are; but the problem is, his versions of Mayakovsky are imprinted in my brain and I have trouble getting on with any other versions, however much more accurate they may be! either be angel or be demon. However, the version rendered by Michael Frayn in the Penguin book is slightly different. is to pass by and leave no trace. The sense is much the same, although there is a particular emphasis in the second with the addition of the word “shining”. I like both, despite their differences, though I find those differences intriguing. How is living with another? And I confess I like the second one less; it doesn’t speak to me in the same way as the first version, and I wonder whether the structure was enforced by Kneller’s wish to make the poem rhyme (which I never really expect in a translated work). Interestingly the editors of the Penguin book chose to include Feinstein’s version of this poem, and I believe her versions are highly regarded. I had a similar issue with one of Akhmatova’s verses “Echo” which I blogged about, and the original version I had read many years ago still seems to me to be superior as verse. So I think it’s definitely a case of exploring the various poetic translations and finding out which ones appeal to me most. Certainly the Penguin book is one I’ll return to, as I trust Chandler and Dralyuk, having read and related to many of their translations. And as long as the translators haven’t invented new bits of the works (like one hideous book I read some time ago…) I shall be content when I find the version I like. And I would urge you to search out Peter Daniels’ translation of Khodasevich‘s poem “Look For Me” which is online at various places – it’s quite stunningly gorgeous and it’s what made me buy this book. Penguin Modern Poets #17 – yes, I know I’ve got completely behind with my reading of this series, but I hardly ever see them second-hand, and it was 49p in the Oxfam and it has Kathleen Raine. I’ll get back to this series eventually – honest! Pulse by Julian Barnes – I’ve loved my recent reads of Barnes’ work, and this is short stories. I’ve not read any of his shorter works so for £1.49 I’m happy to have a go! Lud-in-the-Mist by Hope Mirrlees – all I know about Mirrlees is that she has a Woolfian connection, so when I saw this lurking in the local BookCrossing location (Caffe Nero) I figured it should come home with me. The Wives by Alexandra Popoff – I read about this online somewhere, and for the life of me I don’t know where. It’s about the wives of Tolstoy, Dostoevsky, Bulgakov etc etc and how they were literary partners and support to their husbands. Sounds just fascinating and this is a lovely second-hand-but-in-wonderful-condition-and-very-cheap copy. Result! This little lovely has been on my radar for a while, and as I’m having a bit of a Russian poetry binge at the moment and want to read a range of different translations, I thought “WTF! I work for a living, I shall buy books!” and sent off for it. More of the Russians in a later post, as I hinted above! Again, a lovely little chapbook I’ve been aware of for a while which is stuffed with Mayakovsky (amongst others) and translated by Boris Dralyuk! The cover image is from a Mayakovsky agitprop poster, and the inside is equally beautifully illustrated as well as containing an interview with the translator. Why have I never bought a copy before? Possibly because I’ve been trying to be good about book purchases (and, frankly, failing) and also because the price is not low as it’s from a small press. However, for some unknown reason to do with the weird vagaries of book pricing, I happened upon it the other day with the price slashed. So I ordered it, and even more weirdly the next day it had returned to full price. No, I don’t understand it either. Candlestick Press are known for producing beautiful little themed booklets which are designed to send instead of a card; indeed, I’m pretty sure I have one based on “Mothers” which was gifted to me one Mothers’ Day (by Middle Child, if my memory doesn’t fail me). Candlestick have been championed by Dove Grey Reader, and she’s right to do so – personally, I think that anything which gets people reading more poetry is a Good Thing! Pushkin Press, of course, need no introducing – they publish the most wonderful books in translation, and are responsible for bringing some brilliant works to us; including all the wonderful Gazdanovs rendered by Bryan Karetnyk, as well as Boris Dralyuk’s excellent Babel translations and his “1917” anthology (one of my favourite reads of last year). Any road up, that’s enough rambling – what do you actually *get* here? Well, you get a beautifully produced, A5 booklet with a stunning cover design, on quality paper and with a matching bookmark (for you to write a message on if you so wish) plus envelope. And the contents are equally stunning; ten poems from the Russians, expertly chosen, in some cases translated, and introduced by Boris Dralyuk. The authors range from Pushkin (of course!) through Akhmatova Tsvetaeva, Mandelstam, Pasternak et al up to Julia Nemirovskaya, a living poet. And each poem is a little gem. What particularly pleased me was the fact that there were poets new to me, including Nemirovskaya and Georgy Ivanov; and I was also pleased to see Nikolay Gumilyov featured, as I’m keen to read more of his work. Half of the works are translated by Dralyuk, the rest by Robert Chandler and Peter France; and some appear here translated for the first time, which is fab! Boris Dralyuk has themed his collection to capture the range of the Russian soul; from myth through terror, taking in art, love and life, the selection really does cover all the bases. In his introduction, he uses a rather beautiful image to describe what he’s trying to do with this anthology, that of leading you into a corridor with multiple enticing doors leading off; each one of which opens into a room full of wonders, and more doors… I was already in that corridor, having opened some of those doors; but what this marvellous little collection has done is offered me new doors to open, new poets to explore and more wonderful Russian verse which is always balm to the soul. If, like me, you love Russian poetry you should still buy this booklet because it’s such an illuminating collection; but if you’ve never read the Russians, it’s the perfect place to enter the corridor and begin your journey of exploration – you won’t be disappointed! as I wait for her whom no one can command. fades before her who bears the flute in her hand. staring me down, serene and pitiless.